Kynareth's Grotto is a small unmarked cave west of the Imperial City (plugin-specific). 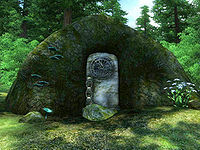 It contains only one zone, Kynareth's Grotto. The cave's exterior is referred to as the Grove of Trials. This small cave only becomes available once you have downloaded the Knights of the Nine official plug-in. It is inaccessible until after the test against the Forest Guardian at the Grove of Trials during the quest Nature's Fury. This cave contains 10 Flax plants, 7 Green Stain Shelf plants, 5 Summer Bolete plants and 14 Viper's Bugloss plants. 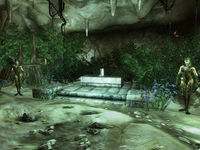 This location provides the single largest source of Green Stain Shelf Cap in the game: there are eight of the plants surrounding the cave entrance (without the plug-in, there are only 24 such plants in the entire game). Another seven can be found within the cave, making this small cave a prime location for alchemists. This small cave is incredibly straightforward. 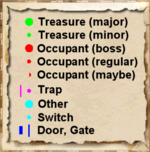 You will enter from the door labeled Out on the map. Walk down a small ramp to emerge into a cavern with a great many bushes and other surface plants. Ignore the two non-aggressive spriggans and take the Boots of the Crusader off of the center pedestal at location Q on map. 2 Spriggans (non-aggressive; non-respawning). You will receive one Infamy point if you choose to kill either of them. This page was last modified on 9 November 2018, at 15:34.